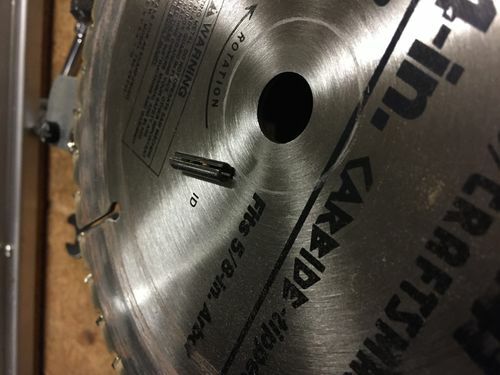 I thought I would post this for folks out there who pick up old Craftsman Radial Arm Saws and notice a runout or wobble in the blade. I recently picked up a cheap Craftsman RAS on CL for $75 that essentially was all but unused in its 40 years. Some of the parts were still in the original packaging (extension table, etc). So I went for it. Got it home. Noticed a slight wobble in the blade. .030 or so. Changed Blades. Still Wobbling. so I removed the blade. Checked the motor arbor. It was rotating with about a .005 wobble. Then I noticed a roll pin holding the nut next to the motor used to hold the arbor to loosen the blade nut. The roll pin goes all the way through the nut and motor arbor. I removed that pin and noticed that the hole no longer lined up. The motor arbor was under a twist load by the pin. Checked the arbor again. It was perfectly straight. Mounted the blade. The blade now runs true. 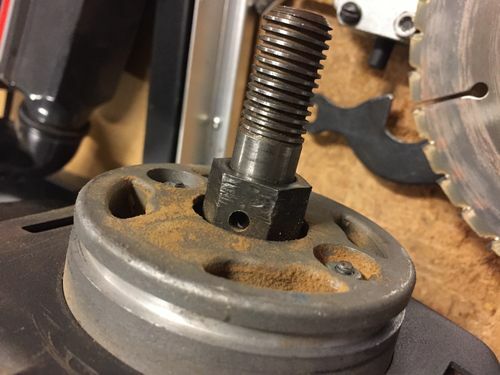 My only remaining challenge is to either drill out that roll pin hole and put the pin back in, or otherwise put something back in there to hold that nut. In any case, before you throw that old Craftsman away because of a bent shaft/blade wobble, remove that pin and check again. Pics please. My 1978 RAS C’man didn’t have a nut behind the blade. Just an arbor flange. I used a plastic (?) blade holder and the standard flange nut wrench to loosen or tighten the blade nut. Glad ya got the prob fixed, and be sure not to overtighten the blade nut. It will “snug up” on its own when running.